We are so very sorry to hear about dear Bella. She was always one our our favorites and seeing her always made us smile. Love and hugs from all of us. My heart breaks for you. I'm so very sorry Sending vibrant purrs of healing and comfort. So sorry to hear about Bella! We are so sorry to hear this news. She was indeed a sweetie and we know she enjoyed her life with you. We send you comforting purrs as this is a hard loss. We are sorry for the loss of your lovely Bella. We know how hard it is to say good-bye. A warm hug of comfort. We're so sorry. 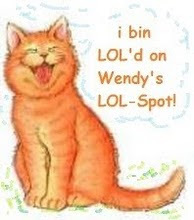 Purrs and prayers to all of you. 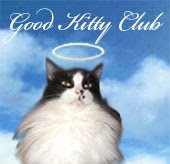 We're sending purrs and prayers to you at this sad time. Oh, Karen, we are so very sorry to hear that your precious Bella has gone to the Bridge. What a special girl she was, and we were very honored that you shared her with us. Through your writing and photos, we, too, loved her very much. Hugs, purrs and prayers, and much love to you all. We are so sorry to hear about Bella. She reminded us so much of Sweet Praline and we know the two of them are at the bridge now watching over all of us. Karen, you gave Bella such a wonderful life! My thoughts are with you. so many purrs and hugs you. 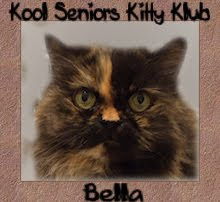 We are so sorry to hear about Bella--definitely a QueenCat of her home :) We enjoyed reading about her...much love. I am very sorry for the loss of your beautiful Bella. We're so very sorry for your loss. Puurs and hugs to all of you from us. We were so very sorry to hear about Bella. Purrs to your family. Bella was such a sweet girl, we are so sorry she lost her battle. Comforting purrs and paws of sympathy to your family. I know you will miss her a lot. We are so so sorry about Bella. She was a great cat and we know how sad you are. Big hugs to you Karen. We send you our Best Purrs Of Comfort about Bella going over The Bridge. We know how much she is missed. 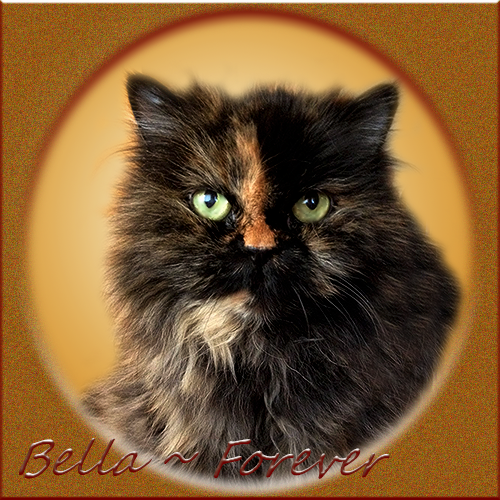 We're deeply saddened by the news of Bella's passing and are sending you purrs and purrayers. Hugs. We are so sad to hear that precious, beautiful Bella has gone to the Bridge. We understand how difficult it is to part with such a dear member of your family. Our sincere condolences over this terrible loss and we will keep your family in our prayers. Wishing you all comfort at this time of great sorrow...hugs and love. We are so very sorry to hear about your sweet Bella. She was beautiful! What a sweet little face. We can see right through the photo why she was so special. Sending purrs and comfort. - Love, Alana and Crepes. Karen I am so deeply sorry about the loss of your beloved Bella. I remember her very fondly, what a beauty she will always be and such a special place she will always hold in your heart. Keeping you in my thoughts. I'm so, so sorry for you loss. She was such a beauty. We're so sorry to hear about your sweet little Bella. What a beautiful little lady; her markings are so unusual. We send purrs and prayers. "The Boys", Hope and Mom Karen at Kittens n Things. We are so sorry that your beautiful Bella has gone over Rainbow Bridge. We know you will all be heartbroken. Sweet Bella will be missed by so many of us who loved her. Sending lots of hugs to you in this loss. So very sorry for the loss of beautiful Bella. I am so sorry for your loss. Bella was a beauty. I send you comforting purrs. So sorry to hear about Bella's passing. We will miss her too. Sending much love and many purrs. xoxo from Katie, Tasha, Franklin, Dobby, and Molly. We are sorry to hear that Bella has left for the Bridge. Sending healing purrs and love. Bella looks lik an amazing girl! I m so sorry you lost her. It's always so tough when we say goodbye, I want mine to live forever - right eh? Bella we will all meet again one day. We are so sorry little Bella was needed at the Bridge. We'll look for her star in the heavens. We are so sad to hear that little Bella has gone over the Rainbow Bridge. She is so sweet and we will miss her. Dear Bella please watch over us all as you run and play until that day we all meet again. What terrible news. What a beautiful little fluff ball she looks. She will undoubtedly leave a hole in your lives, for which I am sorry. Godspeed, Bella. So sorry for your loss. What a beautiful graphic that is of Bella. I am dealing with a cat with kidney failure myself, so I have an inkling of what you must have gone through before it was time for her to cross the bridge. Sending hugs to you and your furry crew. I am so very very sorry for your loss. Words cannot exactly express the sorrow I feel for you. Such a beautiful girl too. Thoughts and prayers are with you during this difficult time. We are so sorry to hear about Bella's passing. If I recall, you adopted her as an elderly kitty and gave her an exceedingly loving home for the remainder of her life. I'm sure you and the other kitties are missing her, but she will provide you with cherished memories forever. 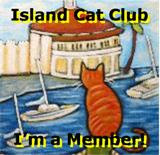 Our love to you and all of your sweet cats, including lovely Bella. Karen, we are so sorry to hear of Bella's crossing. Out prayers and purrs of comfort go with you. God's Speed, Bella, until you meet again. Bella was beautiful. We are sorry for your loss. Prayers and purrs for you today. We are so sorry you lost Bella. I know how heartbreaking this is. We lost Panther last June. I still feel pain about that. So my heart goes out to you.. so glad you have the others! Stopping by to leave our sincerest condolences on the loss of your dearest Bella. Bella was so beautiful. We are very sorry for your loss. We're so sorry about Bella. Purrs and hugs from all of us! All of us here at the House of the Mostly Black Cats are sad to hear of your loss. Fly free little Bella. We are so very sorry to hear about sweet Bella...our hearts go out to you. It is so very difficult when we lose one of our furry family members. May your memories bring you some comfort during this difficult time. We are so sorry that sweet little Bella ran over The Bridge. She was a little sweetheart. Sending you love & rumbly purrs, may happy memories of a gorgeous little girl, fill your hearts soonest. My heart breaks for your precious sweetheart... She was so beautiful. All the cat blogosphere grieves with you and remember her sweet face.